40 Independent Stops, 52 Ranks across Three Manuals & Pedal. Exciting new instrument incorporating judiciously re-incorporated pre-existing pipework and façade materials. Sometimes great new organs result when materials from older instruments are re-crafted and re-purposed. Many of the best builders throughout history have re-used former instruments to varying degrees in their new work. 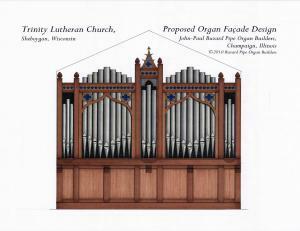 Our Opus 41 began life as a Moller Organ, rebuilt and enlarged several times during its history. 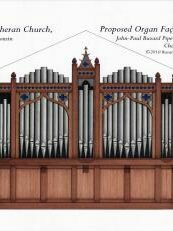 We happily agreed to re-use the best of the existing materials, all the while considering this project a commission to build a new organ. The façade’s casework, for example, is the original Moller woodworking, re-designed and renewed, now including speaking pipes of the Great and Pedal 8’ Principals. We respect our clients’ musical and liturgical needs, and the good work of those builders who precede us. In this case, Trinity Lutheran Church wanted us to build them an organ which would meet the rich musical and liturgical needs of traditional Lutheran worship, honor the gifts of past donors of the existing organ, and respect the deep German heritage of the Congregation and the wider community. They loved the tonal depth of our organs, but wondered if we could perhaps stretch our “Anglo-American” style and thereby create a unique work of art – just for them. The greatest artists throughout history are those who have taken existing styles and stretched them to make their own new style. So, it is with styles of organbuilding. It is the classic discipline which we follow (which extends from the pipe scaling and voicing through the use of slider and pallet windchests) which allows us to craft our sound to meet a wide variety of contexts. For example, an organ for Lutheran worship should not be exclusively thin, top-heavy and screechy (as are many examples of Organ Reform, a.k.a. “Lutheran” organs); on the other hand its Principals probably shouldn’t be Diapasons because its music places a greater importance on transparency of tone. A successful organ – style, denomination, and musical use notwithstanding – needs to be able to text-paint the words being sung or the mood being communicated by the composition. A significant part of Lutheran hymnody expresses profound darkness alongside the joyous light of redemption. Therefore, ought not its organ also be able to portray darkness as well as light? Shouldn’t the organ be able to thunder and shake the floor – even when playing softly? We were blessed to receive a strong endorsement of our work by Kantor Rev. 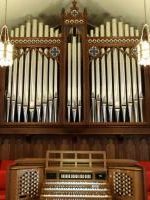 Richard Resch from Concordia Theological Seminary in Fort Wayne, Indiana, and gratefully accepted an invitation to build this organ by Trinity Lutheran Church’s Director of Music, Brian Heinlein. We were asked to create the quintessential “Lutheran Organ” for Trinity parish’s expansive and impressive music program, combining the overall effect of our own “house style” with the specific items which differentiate the two. The result of the full organ, and the ability to make seamless crescendos and diminuendos, is that of a Buzard Organ – one simply gets to full organ a bit differently! Principals are light in nature, flutes transparent. Strings are typically rich and warm, and in one instance explore colors created by tapered pipes. Reeds, while quite similar to those found in our other new work, are slightly adjusted to the nature of what was wanted. 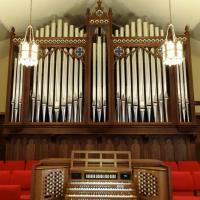 The most recent previous rebuild had been undertaken by the former Schlicker Organ Company. A significant amount of the pipework added during this rebuilding was new. The Schlicker organ used low wind pressures, and therefore low cut-ups in the flue pipes. Therefore it was economically and artistically responsible to re-use them, altering the scales as appropriate, and cutting the mouths higher to meet the new tonal context. The original Pedal 16’ open wood Diapason was retained, modified with new beards and proper tuning panels. The original Swell/Pedal 16’ Lieblich Gedeckt was too small of scale to do its job, so we made four new pipes which are mitered and bolted to the ceiling of the Swell expression box. Our Tonal Director, Brian Davis created this magical synthesis. Even before tonal finishing began, we could all tell that this was going to be a very special organ for everyone concerned. Each of our organs is a custom designed and built musical instrument because we draw upon an intimate knowledge of many styles and schools of voicing, as well as aspects of tonal design for the particular musical contexts at hand. Add that to sensitivity for one’s individual style and you have the making of art. The project for Trinity Lutheran Church in Sheboygan was full of tonal challenges from the very beginning. We were tasked to build an organ for the parish that would musically perform all of the needs of the Lutheran liturgy as well as the huge treasure of music written for the church. On top of that, this instrument also needed to be able to convincingly play more modern and romantic repertoire. The old instrument had been redone several times by various firms and was leaning in the direction of bright and thin. Some stops sounded pretty individually, but had nothing else in the organ with which to blend. Herein was the largest problem of the old instrument. It did not meet the first and foremost requirement in organs that I voice, which is that the stops must blend, blend, blend! A copy of a set of pipes from “Saint So and So” doesn’t automatically mean that it will be successful in a coherent instrument! You can scale things properly so that they will blend, and still capture the essence of the sound you are seeking. And so we set forth on conceiving a tonal design which would blend well, fill the sanctuary with sound and satisfy the musical needs of the congregation. Scales needed for the job were drawn up. When old pipes could be fit into the scheme they were re-used. Several were liberally re-scaled to make them work in the new sound scheme. Where there were gaps in the scaling concept, new pipes were ordered to fill these in. In this way, a pool of properly scaled pipework was ready to be voiced, with the intention of having a bit brighter sound than what we would do otherwise. Nicking is light, and the pipes have a light speech to them, which is charming but never dominates the tone itself. The result is an organ in which the flues are warm and singing and crowned by upperwork which is bright, but does not overshadow the lower pitches. It is very much a concept from the organ reform movement. Many organs in Europe which inspired the organ reform movement are like this and perform as such in their own environment. That is the key! We do not copy what we see and hear in older organs but rather strive to recreate the essence of this sound in our rooms changing what is necessary about pipe construction in order to achieve this. The reeds in the organ are what give the instrument its special character. Overall they are brighter than what we normally would use, as the instrument as a whole is also this way. Stops more traditional to what you would find in a Lutheran organ are also employed in the instrument. The Schalmei, Dulzian and Fagott are all present in the organ as well as a variety of trumpets. Following the concept of creating what is needed, rather than just copying what was done in an organ of the past, lead to new sounds coming out of a Buzard organ. Many hours of consulting with our pipe maker Christoph Ulmer at Killinger Pfeifen Freiberg went into developing these reeds. He would look at the scale and shallot suggestions I proposed, shake his head and call me a crazy Texan, and then use them to create unique and truly beautiful voices for the organ which make the instrument so versatile. Only one old reed was of use in the new instrument. The old swell Oboe 4 had a new bottom octave made for it. The stop was originally too soft to be useful, but the scale and lengths of the pipes were good. The shallots were therefore milled open here at our shop and new tongues were cut so that the revoiced Oboe would sing at an appropriate volume. Reusing old pipework in a rebuild of an organ is infinitely more difficult than simply starting from scratch with a totally new instrument. I am honored by the trust placed in us by Kantor Richard Resch and the Music Director at Trinity Lutheran, Brian Heinlein. The support of the entire congregation was wonderful! You will not find better people to work with anywhere. It is my hope that our creation will serve God and them as well for years to come!